This small mountain lies near Salatiga, to the north of the huge Merbabu mountain. It is very easy to ‘climb’ because there is a road to the communications towers at the summit. Apparently it is very popular with paragliders. Entry is via Dalangan village, which lies to the south of the mountain, and you can actually drive all the way to the very top. 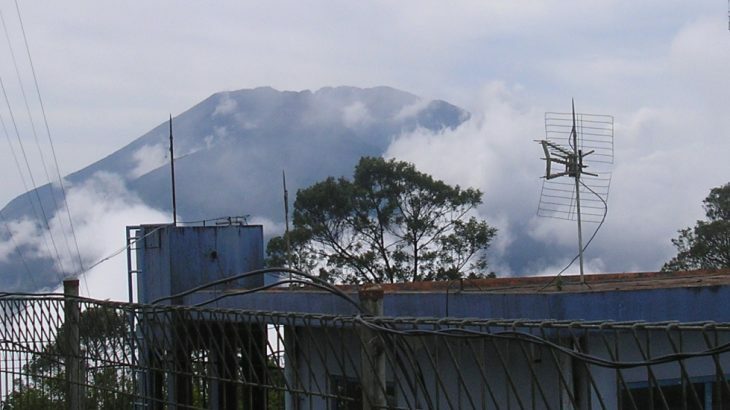 In clear weather the views of the higher mountains of Central Java are fabulous, although the summit itself is a jungle of radio masts and antennae! From Dalangan village (approximately 1,300m), there is a rusty Telomoyo sign which points the way to metal gates at the base of the mountain. It costs a very reasonable Rp5,000 for entry (per vehicle – in 2010!) and the gates are open from 8am until 5pm daily. The road is very bumpy in places but a regular car should be able to manage it. The only problem would be if you meet another car coming in the opposite direction as there aren’t many places to pull over to one side! You could always get an ojek (motorcycle taxi) from the village – lots of teenagers ride up the mountain at weekends. Alternatively you could even walk up the road – although it is several kilometres long it is very pleasant and there is even a mini waterfall. It would take less than 2 hours on foot, perhaps 3 hours to climb and descend again. The view from the road itself is spectacular – Merbabu, Gunung Andong (the small pyramid mountain across the valley), Sumbing and Sindoro. Indeed, the view is better from the road than from the actual summit itself which is covered in transmitters. At the top, you may need to ask one of the workers in the mast compound to open the gates so you can turn your vehicle around more easily. It takes about 30 minutes each way by motorbike or car from the entrance gates. The smaller Gunung Andong (1,726m) is also a worthwhile outing, especially at dawn and dusk. From the impressive entrance built from empty water bottles at Dusun Sawit it only takes an hour for reasonably fit hikers to reach the summit ridge. Views of Merbabu, Merapi, Telomoyo, Ungaran, Sumbing and Sindoro are fantastic. Once through the bottle entrance you soon reach a T-junction where you take a right. Very soon after, you take a left and from this point on the trail is very obvious and clear, though a little slippery and muddy in wet weather. Some minor bamboo shelters (Pos) are soon reached (Pos 1 Watu Pocong ‘ghost rock’, Pos 2 Watu Gambir ‘resin rock’ and Pos 3 Watu Wayang ‘puppet rock’) as the trail steepens and you suddenly find yourself reaching the rather narrow and airy ridge with steep drops on either side. Straight ahead is a building or mini-pavilion known as Puncak Makam (‘tomb peak’) which houses the grave of Joko Pekik, a respected local man. The backdrop is Sumbing, Sindoro and the flattish ridge of Gunung Prau (Dieng). The main path continues up to the right and the true summit of Gunung Andong (Puncak Jiwa) which has a flagpole and signs. This is a brilliant viewpoint and, given that it only takes an hour to get to, most weekends the entire ridge is covered in tents to the extent that there is no more space for any more! There is also a warung selling snacks! For a bit more peace and quiet, either hike here during the week or continue along the narrow ridge (Jembatan Setan – ‘Devil’s bridge’) in the general direction of Telomoyo. A slightly lower peak (Puncak Alap Alap) on the Andong ridge, this final top is another great vantage point for looking back to the highest Andong peak which from this angle looks very precipitous and like a steep pyramid, plus Merbabu and Merapi to the right (south) and Ungaran to the left. There is also another warung here! Strong hikers can be back down at the village in 45 minutes or less, but this is definitely a place to linger if you’re lucky enough to not be surrounded by 200 tents! Bagging information by Daniel Quinn (updated to include Andong information in January 2018). 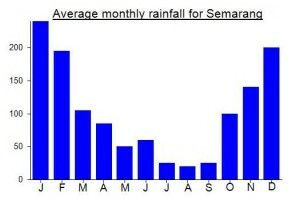 Getting there: The nearest airport is Semarang. There are lots of transport options – taxi, bus/angkot or ojek (motorcycle taxi). From the Salatiga – Magelang road near Kopeng take the small but signposted turning to Dalangan (2km) and take a left at the T-junction. Shortly after the T-junction take a right to the entrance gate. Accommodation: There are many cheap hotels/losmen in the Kopeng area. Permits: For Telomoyo, you have to buy an entrance ticket in Dalangan village, just Rp 5,000 (back in 2010), payable at the entrance gates. For Gunung Andong, the price is Rp8,000 per hiker (in 2018) from the entrance booth in Dusun Sawit which is just ten nimutes by motorbike from Kopeng. Water sources: If you are driving up you obviously won’t need any! If you fancy walking up the road instead, taken sufficient supplies with you. For Gunung Andong, there is a water pipe halfway up, but there are also a couple of warungs selling snacks and drinks on the summit ridge! Hiked up Gn Andong, near Telomoyo, yesterday morning. Fabulous views, apart from the 200 tents that you find up there at the weekend. An easy stroll really – 1 hour up and maximum 1 hour back down again, and just 15 minutes by ojek from Kopeng where there are numerous basic losmen (for Rp100,000 a night or even less) that seem mostly empty even during weekends. Near the ticket booth is a fantastic entrance constructed from hundreds of empty aqua bottles – a truly commendable use of ‘litter’. Anyway, if Telomoyo is too easy for you (you can drive up), then Andong is greatly recommended for beginner hikers. You don’t often get such an amazing panorama for so little effort. I set off hiking at around 3.30am and was up on the ridge by 4.30am ish, going slowly. A little cloudy (it is January after all) but still a great view in all directions. A bit too much noise from local campers (I had to ask one boy to turn his incredibly loud ghettoblaster down) but, alas, that is Java these days. I actually got a Grab ojek all the way from Semarang Tawang station to Kopeng. Just Rp108,000 (and took nearly 2 hours due to a fair bit of traiffic near Semarang). Gave him Rp150,000 though, as he would obviously struggle to find more customers heading in the opposite direction. Kopeng and the Ketep Pass over to Magelang is a fabulous spot with enormous potential. The temperature is perfect, the views stunning, and you can grow all sorts of nice vegetables up here that are impossible to cultivate at sea level. Beer is readily available and there’s even a 24-hour Alfamart. More serious hikers will know this area as the Cuntel route up Merbabu starts/ends here.